Sealaska Heritage Institute (SHI) is bringing Washington-based Tsimshian master artist David A. Boxley to Juneau to teach formline design to inmates at the local prison. Boxley, an advanced Tsimshian language student, also will teach mini-immersion classes in the evenings at the Walter Soboleff Building. The institute is sponsoring formline design classes to connect inmates to their culture and to help them earn a living upon release, said SHI President Rosita Worl. “We want our people to have an outlet that connects them to their culture and that could supplement their income when they return home,” Worl said. SHI is co-sponsoring the evening language classes, which were organized by Nancy Barnes. Haayk Foundation also is a co-sponsor. The classes at Lemon Creek Correctional Center are scheduled 9-4pm, Monday-Thursday, Aug. 24-27. 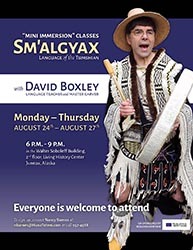 The Tsmishian classes at the Living History Center in the Walter Soboleff Building are scheduled 6-9pm, Monday-Thursday, Aug. 24-27.